MarketSaw - 3D Movies, Gaming and Technology: James Cameron's "Avatar" Secrets Revealed: Warning Spoilers ! 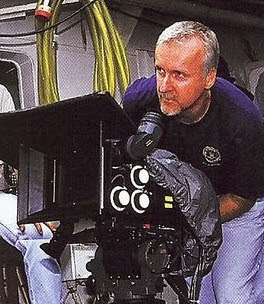 James Cameron's "Avatar" Secrets Revealed: Warning Spoilers ! **UPDATED (March 4th): Just wanted to clarify that until Cameron comes out and states otherwise, the original thought was that "Avatar" would be about 60% CGI. You can see the outdoor green screens here and here; they look ENORMOUS. However, there is a large live action component as well that Cameron must feel deserves the detailed set treatment - mainly interior shots it appears. Also it wouldn't take much to move the Biolabs from inside to the exterior green scene to create the environment. I also wanted to say that we don't know if they are creating life sized plants for this movie - though it would make sense to do so in some cases. Many flora shots would be CGI - my source was referring to "how others had the whole communication thing explained to them" by the powers at be. So whether it is exposed to the audience in a scientific way (sort of how in "Jurassic Park" they explained how they retrieved the DNA from dinosaurs) or whether they plan on "suspending belief" of the audience (i.e. unexplained) remains to be seen. Either way, it is an awesome premise and BEGS my curiosity. One thing is certain - science plays an interesting role in this movie; whether they keep the "theory" behind various communication techniques in a black box or expose it like in Jurassic Park is a guess at this point! My conjecture would be that Grace (Sigourney Weaver) explains it to someone and the audience (of course) listens in. If you want the details, highlight the white text below as it does contain spoilers. Got some VERY interesting news from one of my "Avatar" sources that was involved with getting this 3D motion picture made. AWESOME news in fact. In fact, you may not want to read this as there are definite mini-spoilers in this that may affect your viewing pleasure. There were hundreds of workers building the sets for Avatar - MDF was being thrown around like candy to make the sets as realistic as possible - and it was very successful. The transport ships for instance achieved a "matte steel appearance" that was undetectable. Those transport ships look pretty much like the new Battlestar Gallactica transports, but much bigger - like ten times bigger. These sets filled the interior of the set buildings in Wellington - to the rafters. All very real looking and NOT scaled down - it was all life size. This is mainly where the security forces interior scenes were shot. It was large (30 x 30 feet) made to look like steel construction with only a few windows to view the outside world. The feeling that was conveyed with this structure was that the soldiers were trying to bring their own home with them to this alien planet Pandora, and ignore what was happening outside - kind of like what happens when soldiers are deployed overseas today and they set up coffee shops, etc to keep from feeling terribly homesick. On the wall of the mess hall was a large US flag that takes up half the space - something like 10 x 15 feet) - this could indicate political overtones for the movie. There were other buildings being made that were for science related things. My source only saw these labs from the outside and they seemed very true to their nature. I spoke to some other workers and they said that they look like typical laboratories - one larger lab (about 30 x 30 feet) and one mobile lab (which was about 6 x 15 feet). Sigourney Weaver's character who plays Grace in "Avatar" spends a lot of time in a control room in the bigger one. Apparently the animals can communicate with the plants of Pandora, but my source was kind of hazy on that. Not only that, but the native Na'vi inhabitants take their own hair and weave it into the hair of Pandora's animals and can communicate that way to them! Many workers were talking about how they are using LED lights to show how plants "talk" to other plants on the planet. They use these lights to show how electrons move back and forth between plants through their root system. Again - my source didn't know much more than that. However, if you examine the plants in the photo here - you can see the luminosity that is being spoken of that seems to be present not only in the plants but also in the Na'vi natives of Pandora. A lot of speculation was taking place on the set about how the Avatar chambers work. This is where humans link up with their native avatars to kind of take over their bodies. The chambers were really very cool and if you can picture the cryo chambers in the Alien movies, take those and put them upright with a darker appearance. I suspect that Sigourney Weaver's Grace plays a key role in discovering the crucial communication methods and applying them to humans. One can see a progression here of humans encountering this awesome alien communication system and then taking that idea, studying how it is done in the labs and then applying it to human to Na'vi avatar communication. At least that is my thoughts on it. Wow. This movie is going to really redefine the theater going experience! A great story, awesome effects and all in 3D. Man am I psyched. I also want to add that taking photos of the sets was impossible - so none are available (so far anyway).